This is a discussion for the topic NFSAddons Redesign comments on the board NFSAddons Errors & Bugs. Wanna emphazise again: Great job! Especially the search box is very useful and works very well. An additional author search in the download section would be great, but the search box works good enough i think. The brand system with the drop down menu works fine so far. I did not look through all the brands, but i think you should check whats going wrong there. I know i mentioned this before, but still the dead file is online as doublet. So you should keep the reupload or join the uploads to one entry. Still, i think the white background colour is too bright and sterile (especially on the main page). In my oppinion a colored background would look more convenient, maybe a blueish tone... What you think? Okay thats all.. just some quick feedback from me. Thanks for your continued feedback!! Those cars are uploaded with the brands set as Alpine, Land Rover and Ford, instead of Pursuit Cars. 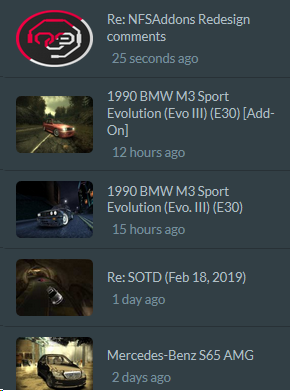 I will work on adding a tag so cars can have multiple categories like that, but that will take a bit of time to get setup and working properly. As for searching by brand, if you select Cars, Tracks and Tools, and then select a brand, it will still show you the tracks and tools, and the brand is only related to the cars, obviously. I thought this might be useful if you still wanted to see the tracks and tools, but I can easily switch that up. What do others think? Ha, thanks for continuously working on the site and keeping it alive! Yeah, there are probably lots of pursuit cars hidden, but I don't mind tracking them down and adding an additional category once that functionality is set up. good point. I'll disable that soon! Looks like we cannot edit/update our own mods. Or I'm too shortsighted to find the Edit button. Edit: In the main page, avatars for latest replies look stretched. Editing your own addons is a feature I have planned. I'll post here when it's ready! Image stretching has been fixed!